StuttgartCitizen.com is an authorized online news source published in the interest of the U.S. military community serving, working and living on U.S. Army installations in the Stuttgart, Germany area. For information about the U.S. Army Garrison Stuttgart services and policies, visit the website at www.stuttgart.army.mil. All editorial content found on StuttgartCitizen.com is published by the U.S. Army Garrison Stuttgart Public Affairs Office. 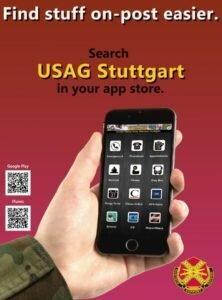 The contents of StuttgartCitizen.com are not necessarily the official views of, or endorsed by, the U.S. government, the Department of Defense or the Department of the Army. The appearance of external third party hyperlinks or applications on this site does not constitute endorsement by USAG Stuttgart of the linked websites, or the information, products or services contained therein. The Department of Defense does not exercise any editorial control over the information you may find at these locations. All links are provided consistent with the stated purpose of these websites. Editorial content from StuttgartCitizen.com may also be found in The Citizen print news, an offset press publication published by AdvantiPro GmbH and printed by Oggersheimer Druckzentrum. The Citizen is distributed within the U.S. Army Garrison Stuttgart community. AdvantiPro is a publishing house and advertising agency based in Kaiserslautern, Germany. It specializes in English-language print and online products serving the largest American military communities in Germany. In the Stuttgart Military Community, AdvantiPro operates as publisher of The Citizen newspaper under an exclusive contract with U.S. Army Garrison Stuttgart. In this capacity, AdvantiPro solicits advertising support to fund the publication of The Citizen, performs the newspaper layout and distributes copies of The Citizen throughout the Stuttgart Military Community. AdvantiPro publishes two other military newspapers: the Kaiserslautern American newspaper, serving Ramstein Air Base, Kaiserslautern, Landstuhl Regional Medical Center and Baumholder; and the Herald Union newspaper, serving the Wiesbaden Military Community.